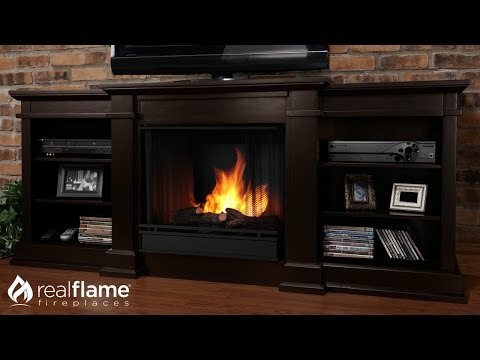 Enjoy the ambiance of a Real Flame fireplace, this substantial freestanding fireplace also doubles as an entertainment center. Constructed of solid wood and veneered MDF construction, this unit is able to hold a television of 100 pounds or less and has adjustable shelving to accommodate most electronics. The hand painted logs and screen kit make this unit look like a real fireplace. Uses 13 oz. Cans of Real Flame Gel Fuel.